With some 1,300 artifacts from Europe’s brutal past, the Nuremberg torture collection was the largest of it’s kind. Torture was abolished in Germany in the early 1800s with the realization that many of the accused had confessed to crimes they didn’t commit in order to end their suffering. 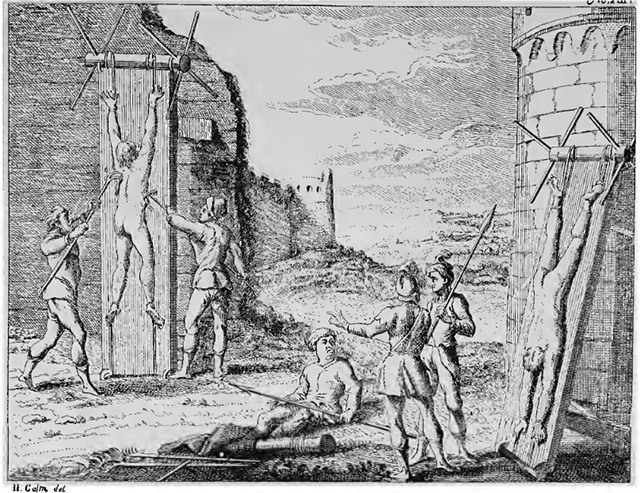 But in the 300 years prior, torture throughout Europe had been elevated to an art form. Innumerable methods had been devised to inflict the most pain possible while extracting confessions or doling out punishments. Lesser offenses, like perjury, having a child out of wedlock, or being a shrew, called for scold’s bridles and branks, stockades, yokes, or collars. More serious offenses such as parricide, infidelity, blasphemy, murder, and, of course, witchcraft, called for more serious measures. For these offenses, the most sadistic devices were crafted. The Pear of Anguish, for example, was inserted into the mouth and then cranked open. Copper boots were designed to be worn by the accused while hot oil was poured into them. The ladder and the Fearful Eliza were designed to stretch the accused and wrench limbs from their joints. But when these menacing implements were no longer in use, a large collection was amassed at the Royal Castle of Nuremberg. The notorious Iron Maiden, a 15th-century invention unique to Nuremberg that researchers believe was never actually used, had been on display there for many years. 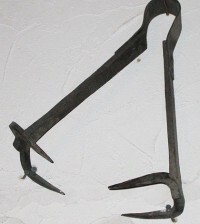 When torture was outlawed, the Iron Maiden was accompanied by the addition of executioner’s swords, branding irons, flagellants, manacles, gallows rope, tongue-tearers, Spanish boots and gaiters for crushing the feet and shin bones, iron spiders for ripping flesh, and numerous other long-standing methods of condemning the accused. From the collection, an illustration of Robert-François Damien, who attempted to assassinate French king Louis XV in 1757. 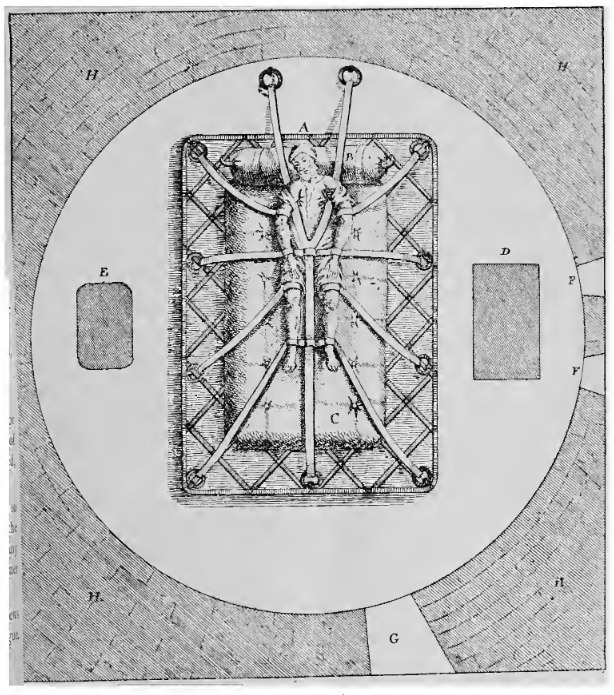 Damien was strapped to an iron bed to prevent him from committing suicide before he could be tried and executed, and also so he could be tortured without being removed from his restraints. He bit off his own tongue hoping he would bleed to death. His teeth were pulled to prevent any further incidence. The collection also included other peculiar artifacts, such as witches’ charms and idols, the mummified head of an executed child murderess, and a model of the castle that belonged to accused witch Agnes Bernauer, who was drowned in the Danube in 1435. In the 19th century, no trip to Bavaria was complete without a stop at the Nuremberg castle to glimpse the very depths of human cruelty. And a visit to the shops, of course, where travelers could buy miniature souvenir Iron Maidens to remember their trip by. In 1890 the entire 1,300-item collection, which included prints, engravings, rare books and other centuries-old documents, was purchased by Charles Henry John Chetwynd-Talbot, England’s “Premier Earl” of Shrewsbury and Talbot. The original Iron Maiden remained at the castle (where it was destroyed when the castle was bombed in 1944) but a replica was produced for the Earl. He packed everything up and sent it on tour. The collection made it’s way around Great Britain, then came to the World’s Fair in Chicago in 1893. Awed crowds wondered at the miracle of Nikola Tesla’s light, and rode the world’s first Ferris Wheel, then gazed in horror and fascination at the barbaric display of real instruments of torture, each with it’s own bloody history. When the exhibit was over, the collection remained in storage in New York until a man named Robert Abels purchased it in 1964. Four years later, in March of 1968, the collection hit the auction block at Sotheby’s and was dispersed. Over the next seven years, a Norwegian holocaust survivor named Arne Coward, who owned a small antique shop in Waikiki, tracked down and purchased most (if not all) of the collection and brought it together again in his home. That year Coward opened his Museum Macabre, marking the first time the pieces were on public display since the New York exhibition closed in 1894. When he died in 1979, the collection was sent to a warehouse in California, where a broker was trying to sell it for Coward’s estate. Ripley’s Believe It or Not! attempted to purchase it, but didn’t value it quite as high as the asking price. Ten years later, in 1989, they did manage to purchase several key items. 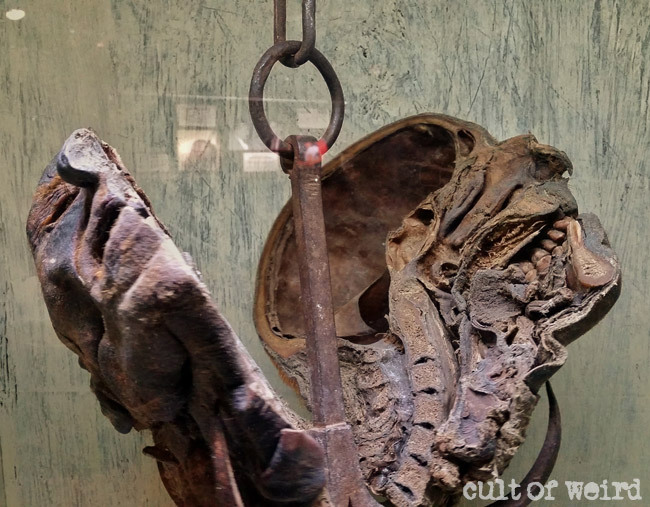 Among them, though it was not part of the Nuremberg collection, was an unidentified anatomical specimen which was later discovered to be the severed head of serial killer Peter Kurten. 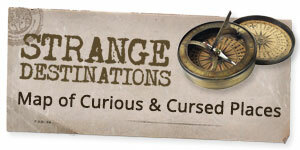 In 2009, what remained of history’s most notorious torture collection wound up on the auction block again. This time it was at Guernsey’s in New York, under the care of Arlan Ettinger. The collection, according to Ettinger, was still in the hands of Coward’s descendants. However, it was no longer complete. 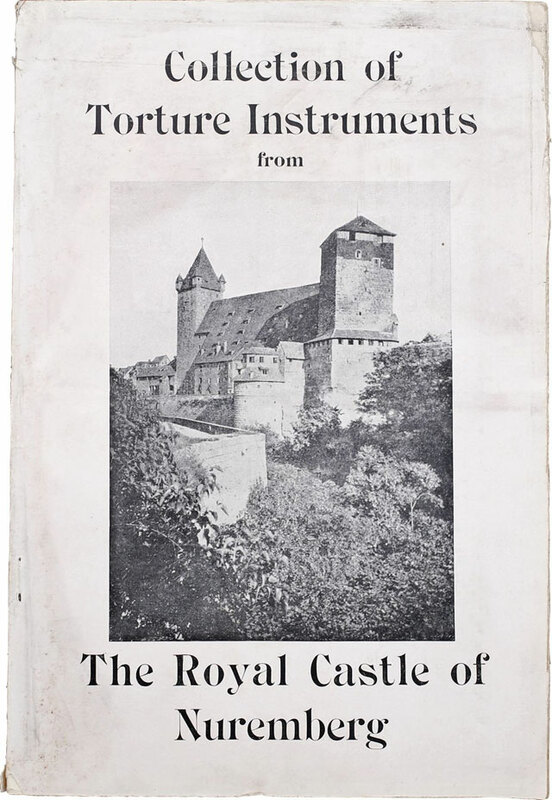 Since that auction, at least a few of the items from the original Nuremberg torture collection have turned up on ebay. 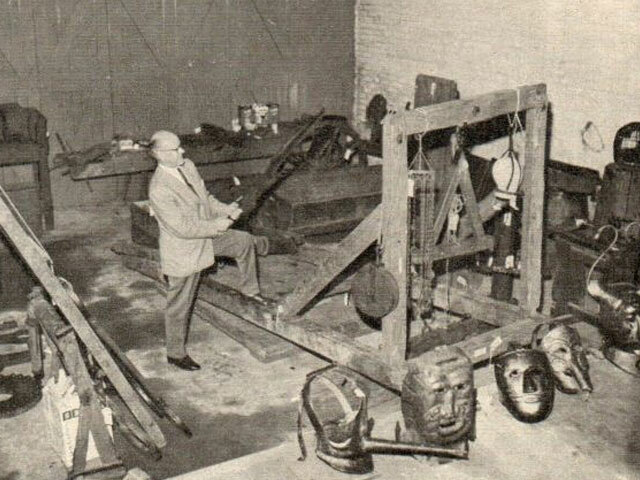 For more on Ripley’s involvement with the collection, watch the fascinating first episode of filmmaker John Borowski’s Serial Killer Culture TV on Amazon.